Based on reviews from 6 experts and 303 users. Learn how our rankings work or see our guide to Nike Tiempo football boots. Updated Apr 2019. Thirty-four years and counting, yet the Nike Tiempo football boot is still one of the best football boots of all time. It is the boot that launched Nike into the football arena. But more than anything else, the Nike Tiempo football boots are known for providing superb comfort. From the time it was first called Nike Air Legend Tiempo up to the present, football fans from all over the world still rave about the legendary soccer boots. Being the longest-running football boot silo from Nike, you can never go wrong with the Nike Tiempo. Over the years, it has evolved massively but one thing is sure, it has kept its heritage comfort, classic style, and elegant simplicity in check at all times. The original version of the Nike Tiempo football boot comes with a classic look but with a modern feel. It features a premium kangaroo leather upper and an old-school outsole. The stud pattern consists of six conical studs. From this version came many more modern and innovative releases in the years that follow. This iconic Nike Tiempo football boot was introduced in the 1994 FIFA World Cup in the USA. Borrowing the words of Dave Daly, former Nike Soccer general manager, “the Tiempo Premier was the first one where we actually made a shoe the athletes around the world actually wanted to wear.” Prior to its release, fans regarded Nike football boots to be irrelevant to the market. The upper is made of kangaroo leather with double-cross stitching in the forefoot area. Just like the original Adidas Copa football boot, it also has a classic fold-over tongue. This Nike Tiempo football boot is the first-ever release of Ronaldinho's signature cleat. It was unveiled using the famous “Crossbar” video where it shows Ronaldinho wearing this football boot for the first time and expertly hits the crossbar four times in a row. This Nike Tiempo football boot uses a premium kangaroo leather material all over the upper. It also features an updated pattern detail in the forefoot. For excellent fit and comfort, this football shoe is equipped with the Zoom Air heel technology in the midsole. This Nike Tiempo football boot has some of the most drastic changes from the original version. New features of this brightly colored Nike Tiempo football boot include the waterproof Kanga Lite upper and Carbon Fiber soleplate. These materials reduced the overall weight of the football boot significantly. As Nike’s response to making lightweight top-end models, this football boot dropped a full 2.0 oz. in weight from the standard version. This popular Nike Tiempo football boot combines vintage style with modern technology. It has the classic feel of a true Nike Tiempo football boot but with the addition of carbon fiber soleplate, Flywire cables, and a Poron insole. Another feature of this football shoe is the revamped stitching placed strategically on the forefoot. It helps minimize the overstretching of the leather and at the same time provides lateral support. Kanga Lite. It is a synthetic material that mimics the comfortable fit and soft touch properties of leather. Together with the All Conditions Control (ACC) technology, they provide a consistent touch on the ball rain or shine. It is used in top-tier models like the Nike Tiempo Legend III Elite. Zoom Air. This hyper-responsive, low-profile cushioning technology integrated into the midsole was designed with agile players in mind. It is composed of thousands of tensile fibers that give way when the foot hits the surface. Upon pushing off, these fibers literally snap which then releases energy back into the foot. This revolutionary technology was originally made for Nike running shoes. It is similar to the cushioning technology found in Adidas Ace 16+ Ultraboost, Adidas Ace 16+ Purecontrol Ultraboost, and Adidas Nemeziz Tango 17+ Ultraboost. Flywire. This futuristic technology found in Nike Tiempo football boots took inspiration from NASA’s use of Vectran fiber. It is composed of lightweight and heavy-duty Vectran filaments that act like cables in suspension bridges. They wrap around the foot for excellent lockdown, support, and flexibility. It is also found in signature Nike running shoe models as well as in Nike Mercurial football boots. Since almost all Nike Tiempo football boots use genuine leather for the upper, they can take up a lot of water when playing during the rainy season. In response to this, the company introduced the Hypershield technology to ensure that the shoe absorbs less water and dries out quicker than other leather football boots. With this amazing technology, Nike has developed a heritage boot that has the benefits of synthetic football boots. Flyknit. This form-fitting upper material is made up of flexible fabric and yarns that create a sock-like construction. With the help of cables in the lateral sides of the upper, it provides a second-skin fit and feels. The first ever Nike Tiempo football boot to feature a Flyknit upper is the Nike Tiempo Legend VII Elite. However, because it is a heritage football boot, the Flyknit material is only found in the tongue and the rear half of the shoe. Anti-clog technology. This exciting technology is found in the soleplates of some soft ground Nike Tiempo football boots. How does it work? As soon as water touches the underside of the shoe, the Anti-clog forms a liquid barrier between the soleplate and the mud. It is used in Nike Tiempo Legend VI SG-PRO Anti-Clog, Nike Tiempo Legend VII Anti-Clog SG-PRO and Nike Tiempo Legend VII Elite Anti-Clog Traction SG-PRO. The first thing that you should consider when deciding which Nike Tiempo football boot you should buy is the soleplate. In order for a football boot to maximize its lifespan, the stud pattern must be compatible with the playing surface. The right kind of stud configuration affects the overall performance and comfort on the pitch. It also prevents some forms of joint injuries. Firm ground football boots - This is the most common stud configuration in the market. The 2017 Nike Tiempo football boots for firm grounds (FG) use the new Hyperstability soleplate which features a combination of bladed, chevron-shaped, and jagged conical studs. This precise stud pattern was polished through the Finite Element Analysis (FEA) for enhanced responsiveness and excellent traction on firm natural grass. Previous Nike Tiempo models feature a thin and flexible soleplate that is similar to the one found on the Nike Hypervenom football boots. The stud pattern is composed of eight conical shaped studs and four bladed studs on the heel to help distribute the pressure. Soft ground football boots - These types of football boots are used on soft, muddy surfaces. Top-end Nike Tiempo football boots in the soft ground (SG) variation comes with a stud wrench and extra sets of metal studs. The stud pattern consists of a mix of removable metal studs and fixed plastic studs. A new feature added to the Nike Tiempo VI and VII football boots is the Anti-Clog technology. It keeps the mud and other elements from getting stuck in the soleplate. Thus, the football shoe maintains its lightweight feel. Artificial grass football boots - The shallow artificial grass (AG) surface needs studs that are slightly shorter compared to the ones used in FG variations. Some Nike Tiempo football boots utilize the glass nylon Nike Hypervenom AG soleplate. Unlike the TPU plastic material used in FG football boots, glass nylon is more resistant to the hot artificial grass surface. The hollow conical studs that come in different sizes are scattered across the soleplate. This allows the player to have plenty of stability. Each stud has a hard plastic base and a rubber tip which allows flexibility when planting on artificial grass surfaces. Also, it prevents the football boot from clinging to the artificial grass surface too much. Indoor football boots - The indoor court (IC) variation of the Nike Tiempo football boots feature an extra layer of leather in the forefoot. This acts as protection against the abrasive artificial surfaces. The soleplate features a solid rubber material that is suitable for flat, hard playing surfaces. An interesting feature of the indoor Nike Tiempo football boots is the cushioning system. Top-end models use Lunarlon cushioning while lower-end models use the traditional Phylon cushioning system. Lunarlon is 30% lighter than Phylon. It features a soft and resilient foam core that is encased in a foam carrier. Using this cushioning system results in springy response and support. The Nike Tiempo series have been headlined by various football superstars by the likes of Ronaldinho and Sergio Ramos. This US sportswear giant even manufactured Nike Tiempo football boots as a commemoration to some of these athletes. 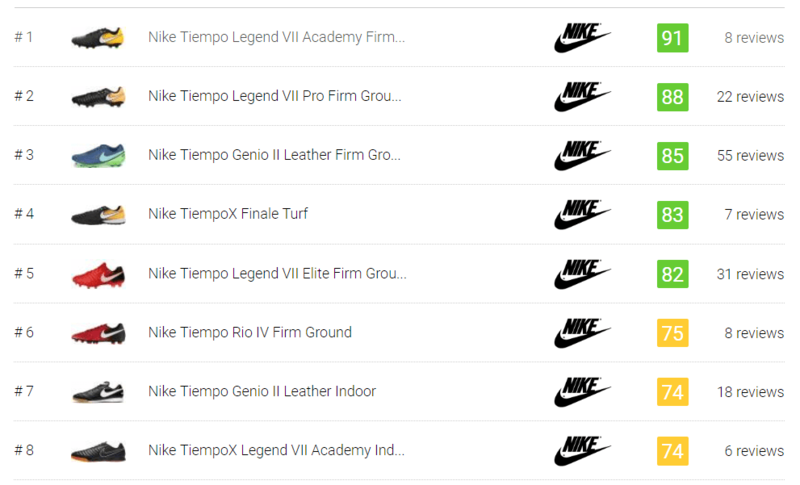 Examples of special edition Nike Tiempo football boots include the Nike Tiempo Ronaldinho R10, Nike Tiempo Ronaldinho Touch of Gold, Nike Tiempo Legend V Totti Limited Edition, Nike Tiempo Legend VI Totti X Roma, Nike Tiempo Legend VI Pirlo Edition, and Nike Tiempo Legend II Corazón Y Sangre. What does ‘heritage football boot’ mean? Heritage football boots are the football boots that have a traditional leather upper. Nike Tiempo, Puma King, and Adidas Copa are among the favorite heritage football boot silos in the market. Which famous football players wore the Nike Tiempo? The Nike Tiempo football boots are worn by the likes of Ronaldhino, Andrea Pirlo, Gerard Piqué, Sergio Ramos, Carlos Tevez, Jerome Boateng, Cesc Fabregas, Carles Puyol, and Joe Cole. Can you personalize the Nike Tiempo football boots? Yes, you can personalize the Nike Tiempo football boots through NikeID. The personalization ranges from choosing colors, text, and graphics. On what surfaces can I use the Nike Tiempo football boots? The Nike Tiempo football boots are available in firm ground (FG), soft ground (SG), artificial grass (AG), and indoor court (IC) variations. Make sure to buy the correct stud pattern for your chosen playing surface. Using your Nike Tiempo football boot on surfaces that it was not intended for can cause premature damages and issues regarding its durability. Why did Nike drop the word “Air” from the Tiempo Legend III series name? Nike decided to drop the Nike Air Zoom technology from the boot when they started making the Nike Tiempo Legend III silo. Instead, they replaced it with the better performing Poron cushioning system. How to spot a fake Nike Tiempo football boot? A fake Nike Tiempo football boot does not have an internal support structure. Instead, it has an embossed design on the upper. It also does not have the authentic leather symbol on the medial side of the football boot. The Swoosh design on the sides of a fake Nike Tiempo football boot has a glossy finish when it hits the light. The authentic one has a matte finish. The Tiempo lettering on the soleplate does not have the same vibrancy as the one found in an authentic pair of Nike Tiempo football boots.